Ed Gray is a painter of city life and the layers of urban stories and people that create the modern city. Traces of recognisable lives lived within the city are revealed in these gritty metropolitan moments drawn from the shadows of the dark grimy streets of London to the glittering spires of the Shard. These paintings are not caricatures, instead they are street scenes that celebrate the character and characters of the city and the theatre of urban life. Everyday people are keenly observed and drawn into sketchbooks to inform paintings that are a multiplicity of events and incidents.The resulting exuberant scenes resonate with allegory and symbolism, revealing the diverse relationships of people to their built environments and to one another within those spaces in a unique empirical exploration of civic identity. Ed Gray’s paintings of the city of London are a modern London pilgrimage, a metropolitan glide that begins in the bustling early morning city streets teeming with crowds, commuters, shoppers, market traders, ambling school children, flustered city workers, harassed cyclists, angry cabbies and patient bus drivers. This is a pictorial journey through London from the South London streets of Bermondsey across the bridges of London and down into the London Underground stations and train stations to emerge in Camden Town and North London’s beautiful Hampstead Heath, returning back to the West End and the delights of the alleys of Soho, taking a diversion to the buzzing Notting Hill Carnival and finally cutting back across the city to bustling Whitechapel and Mile End in the East End. These vibrant scenes echo the rhythms and sounds of the city and are filled with proselytising cries from street preachers, weary sighs from nervous punters in the bookies, melodious buskers, ranting political demonstrators, roaring chants of matchday football fans and the excited laughter of the lido swimmers. Later still in Ed Gray’s paintings the meandering nighthawks appear, the bar crawlers, the desperate fight night boxers, the bored ring card girls, the pearly King and Queen and the watchful policemen.The evening city is a scene of musicians, clubbers and dancers competing with lovers and fighters and always there are the lost and nameless, the drinkers, the afflicted and the downtrodden rough sleepers. Finally we head home on the night bus as street cleaners sweep the old day away. These are the pilgrims and passengers that pass through the endless all-consuming cycle of the city, captured here in pencil and paper and intensified on canvas in layers of paint. 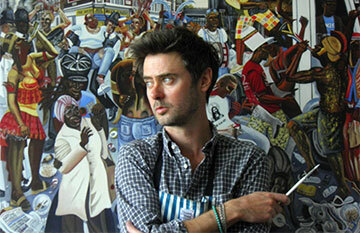 Ed Gray’s paintings are enthused with the spirit of Hogarth, Dickens and Lowry. Nothing is imagined and everything is sketched from life in the streets and painted onto canvas in a collective transmetropolitan tapestry of London, New York, Mexico City, Tokyo, Bangkok and Cape Town and wherever else he may find himself drawn deep into the layers of lives lived in our cities. New Paul Weller video for the song ‘Movin On’ from the album ‘True Meanings’ features Ed creating a painting in his East London studio.